New York City Council is considering landmark legislation that would set strict limits on the carbon emissions of large buildings. As recent reports from the IPCC and the federal government have made clear, there is great urgency to accelerate large-scale action to reduce greenhouse gas emissions. Unlike anything else in the country, the bill, Int. 1253, was introduced by City Council Member Costa Constantinides and sets NYC buildings on a path to meet the City and State goals to reduce total carbon emissions 80% by 2050. If passed, the bill will require buildings larger than 25,000 square feet to meet new greenhouse gas (GHG) emissions targets or face significant fines. Without this bill or something like it, we may not meet the 80×50 goal. Starting in 2022, buildings over 25,000 square feet will each have a maximum limit of carbon emissions (see below). Those limits will step down over time. The bill also creates an office within the NYC Department of Buildings to administer these rules as well as an expert advisory committee comprised of stakeholders like building owners, trade organizations, design professionals, academic research institutions, utilities, environmental organizations. The advisory committee will guide the development of the emissions limits and building performance metrics going forward. Emissions limits vary by occupancy groups. If your building is above the limits listed above, then you will need to identify and install improvements (you may hear engineers or design professionals call them “energy conservation measures”) and make operational changes, and/or purchase or install renewable energy to bring your carbon emissions below the limit. Alternatively, if your building remains above the limit, there will be a fine. Currently in the bill, buildings with any rent-regulated units are exempt from these limits. What Does That Mean For A Typical Residential Building? To begin visualizing how these requirements would play out, we’ve analyzed the impact of the bill on four real multifamily buildings. These buildings were selected from EnergyScoreCards, our energy and water management tool which includes a database of over 35,000 buildings’ energy and water consumption and costs. EnergyScoreCards uses a grading system to indicate how well a building is performing when compared to its true peers. Not to be confused with NYC’s energy efficiency building grades, EnergyScoreCards grades normalize for permanent features of a building like its type, size, geography, metering, apartment size and age. You may notice that buildings 1 and 2 are both pre-war mid-rise buildings that use gas for heating and hot water, but they perform very differently today. Building 1 is steam-heated but well maintained. A few years ago Building 1 underwent a set of comprehensive retrofits funded in part through NYSERDA’s Multifamily Performance Program (MPP), which cut energy use by over 30%. Building 2 is a high energy user – among the worst 25% of similar buildings in EnergyScoreCards – owing in part to significant overheating and poor control of the heating system. Building 3 is a low-rise building that provides senior housing and was built in the early 80s. Building 4 is a recently constructed high-rise building with a number of high-performance design features including solar PV. 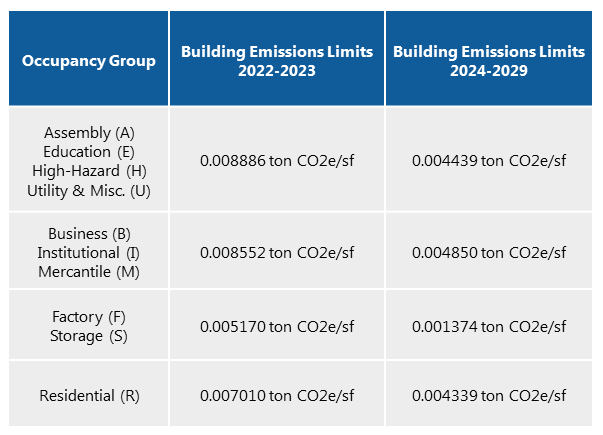 In 2022, assuming that these buildings are performing the same as they are today, all four are under the proposed GHG limit of 0.00701 tons CO2e/SF. Fast forward two years to 2024 and the two top performers, Building 1 and Building 4, just need to maintain current performance to be in compliance, while the other two would require improvements. It is important to note that Building 1 and Building 4 were built almost 100 years apart, with very different systems and design, but are both already meeting the proposed 2024 limits. Buildings 2 and 3 will need to make moderate or substantial upgrades to cut GHG emissions in order to meet the 2024 limits. Building 2, the overheated pre-war mid-rise, needs to make the most significant reductions, which likely would require a comprehensive scope with upgrades to lighting, appliances, heating and domestic hot water systems, building envelope and possibly onsite renewable energy. For those more comfortable thinking in terms of units of energy, here is a useful rule of thumb for multifamily buildings to meet the 2024 emissions limit: a maximum annual usage of 5 kwh/sf and 0.5 therms/sf. Based on the range of performance we see among NYC buildings in EnergyScoreCards, these energy consumption numbers are achievable by well-tuned NYC multifamily buildings built in all eras and with a variety of building systems. Among NYC multifamily buildings receiving an “A” grade in EnergyScoreCards (meaning they are in the best quartile among peer buildings), a large majority already meet the 2024 standard proposed in the bill. How Can You Meet These Limits? Every building is unique, especially in New York, so there’s not a one-size-fits-all answer. To understand what your building truly needs, you must have an experienced energy engineer conduct an energy audit that looks at both capital and operational improvements to reduce greenhouse gases. Some buildings may have problems like overheating or leaks that can be solved without capital investment and lead to large reductions. Others will require substantial upgrades to heating, hot water, appliances, lighting and building insulation and air-sealing. With a detailed study of the building, you’ll have the full context of how your building currently performs and what measures will have the greatest impact on your property. There are a variety of improvements – from simple to moderate to significant measures – to reduce energy use and greenhouse gas emissions that should be on your radar – if they’re not already. The Turning Data Into Action report by Building Energy Exchange, Bright Power, and Sustainable Energy Partnerships analyzed a massive dataset of NYC multifamily buildings to help building owners understand their improvement options. We recommend taking a look at the tearsheets to see more examples of buildings, potential impactful improvements, and their associated GHG and monetary savings. The good news is this new bill will do more than fight climate change. The improvements that you install will provide ongoing savings, improve your building’s performance, reduce your operations costs, and make your residents more comfortable. With increasing public concern about climate change, your residents may also be glad to know their buildings are taking a strong step toward reducing GHGs at home. More steady, long-term decline in emissions caps for buildings to achieve 40×30 and 80×50, rather than a steep drop in 2024 as seen in the current draft. Better definition of renewable energy options to allow buildings to use sources like community solar to meet emissions limits. More nuanced building categories and limits that take into account building characteristics, occupancy, etc. Better alignment of the limits with the NYC energy efficiency building grades. Rather than basing these new grades on ENERGY STAR Scores, which are not directly driven by GHG emissions, we believe it’s time to create an NYC tailored energy and carbon performance metric. 2022 is not far away. Now is the time to start identifying ways you can reduce your building’s GHG emissions. In addition to the Data Into Action report noted above, the Building Energy Exchange has extensive resources to guide building owners and managers in their decision making, including a playbook on upgrading steam heating systems and numerous case studies of successful projects that identify both the positive outcomes and challenges encountered during the process. You can access those resources here. The Community Preservation Corporation (CPC) and Bright Power recently launched CPC VeriFi, which allows owners to quickly explore utility savings and financing options for simple, moderate, and significant energy efficiency improvements. Understand your building’s current performance. Identify a set of practical and impactful options for reducing energy use and GHGs. Explain which package of improvements will yield enough of a reduction in GHG and energy use intensity. Provide the expected annual dollar and carbon savings. Identify and procure rebates and incentives to help pay for the improvements. And the most important indicator of a good partner is that they can measure and track your success to ensure you’ll meet the emissions limits when 2022 rolls around. Remember, going green will get you some green. If you need to install improvements to meet these new limits, your building will be higher performing and better off in the long run. That’s a win for you, a win for your residents, a win for the city, and a win for the environment. Still unsure of what this means for you? Contact us and we’ll answer all of your energy and water questions! Another version of this post can be found on Building Energy Exchange’s blog.